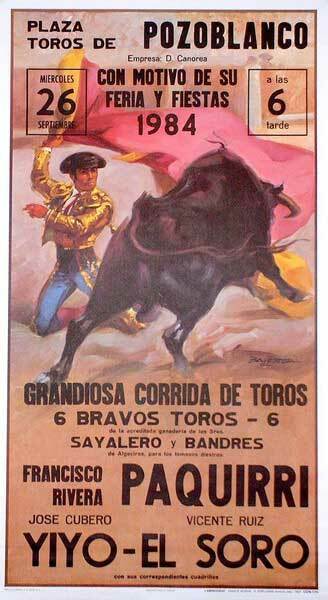 The first demonstration of the bullfighting art is the bullfighting poster. This poster heralds the bullfighting of September 26, 1984, with Francisco Rivera "Paquirri", in Pozoblanco, the bull square where he died. Francisco Rivera "Paquirri" was sharing this corrida with Vicente Ruiz "El Soro" et José Cubero "Yiyo" fatally injuried by a bull named Burlero in Madrid, on September 30. 1985.